The trade and exploitation of natural resources such as cocoa, gold, petroleum and diamonds contributed to the conflict in Côte d’Ivoire and still obstruct the peace process in the country. 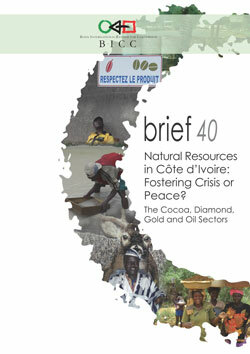 This is one of the conclusions of BICC brief 40, entitled: “Natural Resources in Côte d’Ivoire: Fostering Crisis or Peace? The Cocoa, Diamond, Gold and Oil sectors”. The authors of the BICC brief, Lena Guesnet, Marie Müller and Jolien Schure analyze to what extent the extraction of natural resources has fueled the civil war which raged in Côte d’Ivoire from 2002 to 2004. During that time, rebels, who still occupy the north of the country, fought government troops and loyal militias in the south of the country. There are strong indications that the government used its revenues from cocoa and oil production to pay for part of its war expenditures. The rebel group Forces Nouvelles did the same in the north of the country. The rebel leaders have established an efficient taxation system in parallel to state levies on the trade in natural resources. Individual commanders in the different northern zones profit directly from the smuggling of cocoa, diamonds, and gold. Latest reports from the UN Group of Experts on Côte d’Ivoire also prove that weapons and ammunition are still being smuggled into the north of the country from the neighboring country Burkina Faso—financed by income from the illegal taxation of the trade in natural resources.